In 1923 the 22 founders of Certes Lodge No. 4606 applied for a warrant to hold a Lodge at the Cafe Royal, Regent Street, London. The petition was sponsored by the City of Westminster Lodge No. 1563 and was approved on 14th November 1923. Members of Alexandra Park Lodge No. 1541 also provided great assistance. The Lodge was consecrated as Certes Lodge No. 4606 at Freemasons Hall in Great Queen Street London on Friday 25th January 1924. The first Worshipful Master of the Lodge was W.E Middleton, with 10 candidates and 4 joining members proposed at the meeting. 195 Meetings were held at the Cafe Royal including 7 emergency meetings. In 1942, dining after meetings stopped due to difficulty with food supplies to the Cafe Royale. Dining resumed in February 1946, albeit on a reduced menu! The April 1949 meeting was a special meeting commemorating our Silver Jubilee – we had a great dinner and published a commemorative Silver Jubilee brochure to commemorate the meeting. After an appeal by the MW Grand Master, Certes became a Hall Stone lodge. 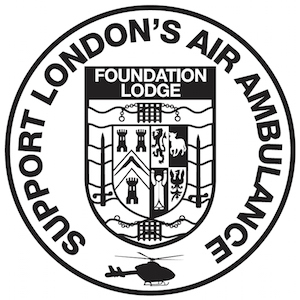 In 1966 the lodge contributed £1 per member towards a Trust Fund for Cancer Research and was awarded a commemorative Jewel which is now affixed to the Masters collar. On Tuesday 27th June 1966 HC Everest as Worshipful Master represented the Lodge at the the Installation at the Albert Hall London, of MW Bro HRH The Duke of Kent GCVO ADC as Grand Master. In 1971 Certes moved to the Tower Rooms, Tower Place EC3 London. Since 2015 Certes has met at Freemasons Hall, Great Street London.